How you phrase things could translate to far more or less traffic. Use tools like Google’s keyword tool, Google trends or SEO book to get an idea of the most valuable keywords for you. The ideal keyword will have a high volume of search traffic, with low to medium competition for ranking spots. You can use the Mozbar extension for Google Chrome to judge how strong the competition is for the for your keyword search result. Think of the searcher and their intent. Are you answering a question? Will you be the best result for people searching for this term. As a rule-of-thumb, each post should have one <h1> tag – this is the main title of the post. The h1 tag on WordPress is most often the post title. It is very important for SEO. Be sure that it has a keyword in the front part of it, but also be sure that it makes sense – furthermore, be sure that it makes you want to click it! You should then break it down with sub-headings, these are <h2> tags. 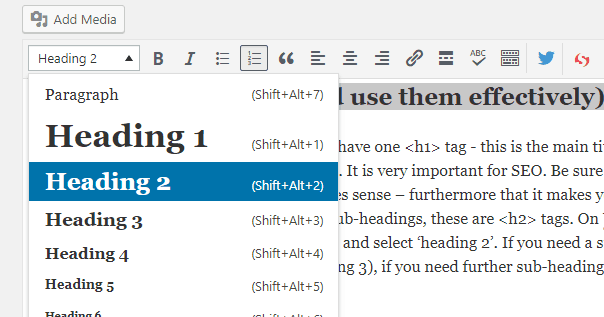 On WordPress, you can use the ‘visual’ editor to simply highlight the heading and select ‘heading 2’. If you need a sub-heading – within those headings – then you should use the h3 tag (heading 3), if you need further sub-heading types, you can have up to <h6>. Each number away from h1 you go, means the words in the heading are less important to the overall document. I try to use LSI keywords, long tail keywords or permutations of the main keyword within my h2’s and I aim to have a h2 tag within every 300-400 words. *LSI (Latent Semantic Indexing) keywords are words which relate to the main subject, see LSIgraph.com to generate keyword ideas. Be sure to have an engaging meta title and meta description filled out and be sure it’s optimised using the keywords and phrases you’ve researched. 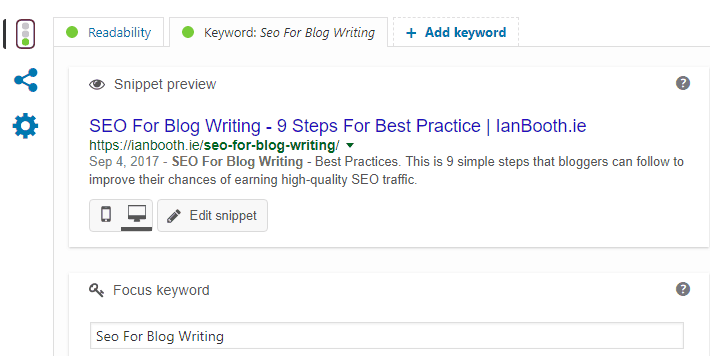 If your website is built on WordPress, you can use the Yoast SEO plugin to fill these out. It’s a free plugin and one of the most used within the WordPress plugin repository. Once installed, Yoast will add a neat little box at the bottom of your post/page text editors which allows you to enter metadata and preview how the page will look on Google search. It also gives you guidance on how you’re doing with on-page SEO standards and readability with pointers and a traffic light score (green=good, red=bad). Get the title right! If you want to get ranked for your keyword/phrase watch the Yoast score, if you want it to get clicked then use the Coschedule analyzer tool to make it an engaging title – it’s hard to get that balance between the two right, but ranking is no good without clicks, but on the flipside, there’ll be no clicks without rankings. Here’s what the Yoast section looks like below your WordPress text editor. Adding images, video or audio is a good idea. Images not only help to make your content easier to consume, but they offer several extra opportunities to have the post to be found. Optimised images can help you get found on Google images or Pinterest for example. Infographics are fantastic for earning links to your website. Audio and video improve the user experience and increase the dwell time on your pages, which is a positive signal. Be sure the file size is reduced to improve page-load speed. Make the dimensions as big as they need to be, before uploading. O WordPress you can then use an image compressing plugin, such as WP Smush to further reduce the file size. Name the image file before uploading, using your keywords. Use your keyword in the ALT tag and never ever leave the ALT tag empty. Write image titles and captions using the keywords. Linking out to great keyword-relevant sources, as references or for further reading is a great thing. Because when Google see’s you’re recommending the same sources they would likely recommend, it gives you some trust. Adversely, linking to spammy sites is bad news for you. There is a myth that all links from your blog should use the rel=”no follow” tag to avoid Google penalties, but that is simply not true. Linking is what the world wide web is all about, it is the fundamental element of what keeps the web growing and Google’s spider bots love to see them. That said, if you’re linking to an affiliate or any kind of sponsored link placement – it is best practice to use the rel=”no follow” tag then. You should also avoid excessively linking out too. You can use the Mozbar Chrome extension to see other websites authority score and a spam rating. You should try to keep the reader engaged with your website, so linking to other posts or pages is a must! For example, you could link to relevant posts or to your product/service page. Did I mention I have a blog post explaining what SEO is all about, in plain English. Add buttons to make it easy for readers to share the posts. For WordPress sites, I can recommend the Social Warfare plugin. You can even add a simple ‘click-to-tweet’ snippet. Be sure to regularly share your blog post on Twitter, Facebook, promote it on Instagram, Snapchat and YouTube. Social signals are important. Do you have a Google+ account? 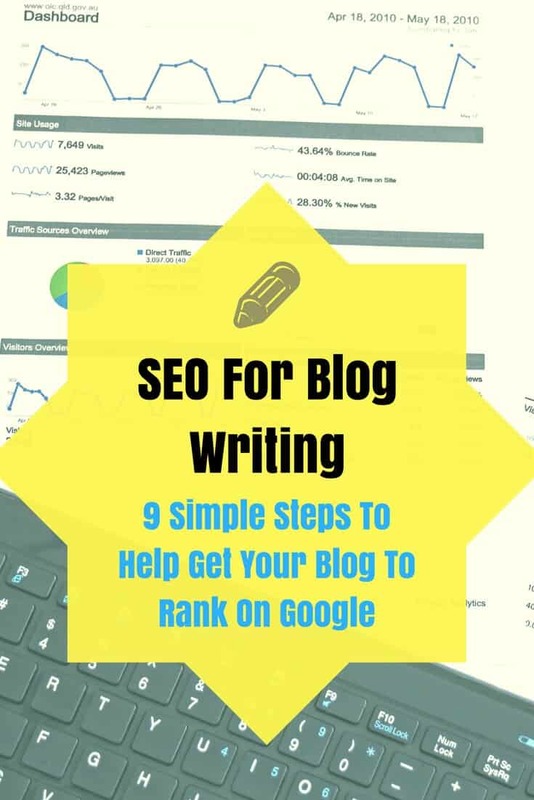 Ok, stick with me here… Nobody uses it, you probably won’t get any clicks – but it is Google and being present there will help you (to some degree) to rank on Google search. You can set up an account, fill out all the profile details and sync it to your favorite social media scheduler (e.g. Buffer, Hootsuite..etc.) then never look at it again (because you’ve enough to be managing already). 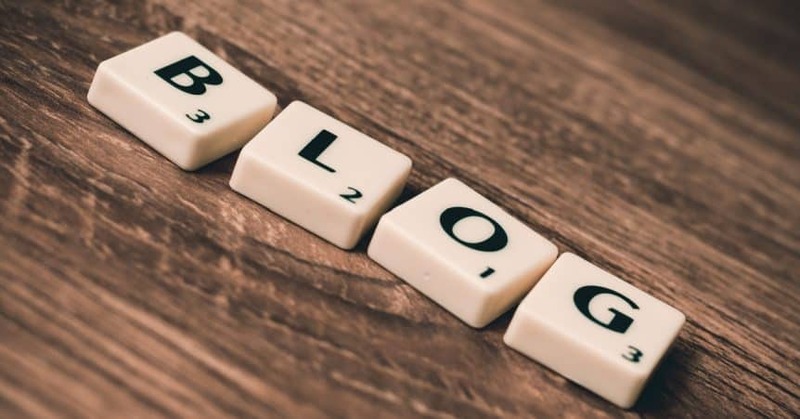 If you mention or reference somebody in your blog post, try tagging them on social media when sharing the blog post out. You never know, they might share it with their audience or even link to it on their site! Be sure to add your post to Ping-O-Mattic and Social Marker to ensure it’s crawled and indexed very quickly by search engines.